In a series of landmark studies, researchers have identified exactly what people who succeed in intimate relationships do differently than those who fail. They discovered a core set of emotional habits that that are so powerfully positive that, when people have them, they end up having satisfying long-term relationships over 90% of the time. The Secrets of Successful Partners seminar series involves an exploration of the core set of emotional habits that are needed to succeed in a love relationship. You’ll learn how people who get their partners to treat them well go about doing it. Paul Weiss is a licensed marriage and family therapist and member of a team of therapist/educators who have pioneered new methods for improving relationships at the Couples Clinic, in Geneva, Illinois. The team’s ideas about relationships have received academic accolades and have also appeared in the Oprah Magazine, the Washington Post, Cosmopolitan, and other magazines. A personable and engaging speaker, Paul is known for his down-to-earth style and sense of humor. His seminars are packed with cutting-edge informa-tion and practical methods for improving relationships. Come with a partner or by yourself. Either way, you’ll leave with a new understanding of what it takes to make an intimate relationship work. 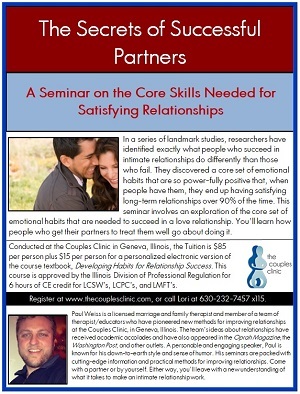 Conducted at the Couples Clinic in Geneva, Illinois, tuition is $85 per person, plus $15 per person for a personalized, electronic version of the course textbook, Developing Habits for Relationship Success. This course is approved by the Illinois Division of Professional Regulation for 6 hours of CE credit for LCSWs, LCPCs, and LMFTs.